Chris Kyle, BioZyme Area Sales Manager for Arkansas-Louisiana territory. BioZyme Inc. recently hired Chris Kyle of Enola, Arkansas as a BioZyme Area Sales Manager for the supplement division. In this position, Kyle is responsible for promoting sales of BioZyme products and supporting BioZyme’s dealer network in Arkansas and Louisiana. BioZyme’s supplement brands include VitaFerm®, Concept∙Aid®, Sure Champ®, VitaCharge® and Vitalize®. “I am extremely excited about the addition of Chris Kyle to the Arkansas-Louisiana territory. Not only does Chris bring a vibrant and energetic work ethic to the table, but he also has a wealth of knowledge in the equine industry. I am extremely excited to see the impact that Chris will make in this territory,” said Alan Lee, BioZyme Director of Sales-North. Kyle, his wife, Lacee and two children, Coree and Kit, are active in the rodeo community and love to hunt and fish. 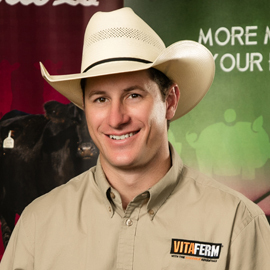 Kyle has a degree in Ag Business from the University of Arkansas at Monticello.